A FEW THINGS YOU (MAYBE?) DIDN'T KNOW ABOUT ME. with my sisters at my sister's graduation. +Even with my friends, I talk way more one-on-one than I do in groups (even in small groups of four or five people). I'm an introvert through and through and am thankful for the friends who understand and share my introversion. +I don't understand sports. I'll watch a little college football but I don't really know that much about how it works (aside from the basics and a few of the players' positions and names). Yep, I'm that girl. +I used to hate and cringe at the idea of dating online, but now that I've started blogging, I could see it as a possibility. It's not something that I'm actively pursuing, but I won't rule it out as a future possibility, either. Sidenote: do you know anyone who's met anyone online? Have you? +I didn't learn how to drive until I graduated high school. I know that a lot of you likely ran out to get your license as soon as you turned 16, but at the time, I knew some people that got into car accidents so I was afraid of getting behind the wheel; my biggest fear being accidentally rear-ending or getting rear-ended by another car. + Back before I got my (current) teaching job, I contemplated going back to school for social work. I love the idea of working more closely with families and if I could re-do my current Bachelors degree, I'd likely get double major in Child Development and Social Work and minor in Spanish. +I wear one ring on my right hand and never take it off. I got it as a junior in high school and use it to remind me to love others and now myself, too. So that's a little list about yours truly. Do we share anything in common? What's something I don't know about you? You know you want to share it! One of my good friends met her husband through online dating. They're both believers, so they did it for the right reasons, and they used lots of caution. But in the end they're an amazing couple and have a cool story! I'd say go for it! - i was the same way about online dating. i've come around the last few months. like you said, i'm not actively pursuing it, but in the future, i might be open to it. - i think you should talk about being asian! i would find it so interesting. That's exactly how I see it! I worry about the weirdos and the scammers out there, but I also know that meeting people online is real (thanks to blogging!). :) If you ever try it, I'd love to hear your thoughts on it! One of my best friends is getting married this week to a guy she met online. But for every success story, I also hear tales of how horrible online dating could be. I got my driver's licence at the end of my junior year, when I was 17 and a half. Then it took me two more years to have my own car, which didn't bother me since I couldn't take a car to college freshman year anyway. Yes to being a total introvert and clueless about sports!! I would really LIKE to know more about sports, but I get so bored every time someone tries to teach me ;-) And I know a surprising amount of people who met online and ended up getting married. It can definitely work! And I've heard of a lot of people who met someone online! I didn't realize how many people have until I started blogging, though. I can't say that it's the right timing for me now, but I could definitely see myself trying it out in the future! i say blog about your heritage, it is a beautiful thing - and i would love to hear about it! online dayting = woot woot! just another avenue for God to use! And you know, I think I will someday! I don't honestly know what I'd say, to be honest, but I think it would make a different kind of blog post--and it's even better to hear that people would actually read it! Also, the whole online dating thing is still foreign territory for me. :) It's not something that I'm actually looking into, but it is something that I can't say won't ever be in my future. I guess I just don't want to say no to something like that too early! And I'm still a little afraid of driving in certain areas, haha. When my family goes down to California, I refuse to drive because it's just sooo much different from where I live! That's how I see it right now. I can't say that I'm ready to start at the moment, but I'm keeping it an option for the future (I'm a little worried about the weirdos and scammers out there!). As a blogger, I've realized just how possible it is to make friends with people online and being the introvert I am, I could see myself using online dating in the future, too. And I won't tell anyone, haha. :) We all need quick work breaks now and then! One on One is so much better than groups. Sports are fun to watch, but aside from the die hard fans, you're not so unusual. Online dating freaks me out, I am always hearing about success stories, but I just don't think I have it in me. I learned to drive before I could consider the dangers and I'm glad for that, otherwise, I may have never learned! I agree with everyone else - blogging about your ethnicity, it would be super interesting! I know movies and shows by who is in them...I am so bad about it that several of my friends will say, " Have you seen X Movie? And don't ask me who is in it because I don't know." And if they can't tell me at least ONE person I can't be sure if I've seen it or not. I considered going into social work too. I am actually glad I didn't because I think it would have made me sick...I love serving families in hands on ways that the system would not allow. And am constantly looking for ways to help out. That's neat that your ring has meaning! You don't know that I'm not a big animal/pet fan but that I find myself smiling at dogs and chit chatting with animals as if they were people (not babytalk nonsense with a weird voice, but the kinds of things I would say to another adult at a bus stop or something). Yesterday I asked my dog if she was thirsty and then I found myself talking about the weather. Every time I do it I realize that I do it way too often! And I wish I had learned to drive sooner! I actually enjoy driving and I think if I hadn't let fear control me, I would have started driving a lot sooner. As for blogging, I think I might blog about being Asian sometime. I don't have anything to blog about right now, but maybe someday! And I had no idea you were interested in social work, too! I still consider it, but I do love the actual classroom environment and I love working with kids. I'd ideally love to be able to work with kids on a more one-on-one (or small group) basis, but I'm not sure what that would look like in a school setting. And like you said, social work is hard! I know some social workers and have no idea how they do such an amazing job with their families day in and day out! Love this post. I definitely talk more one on one than in groups. I'm a bit paranoid about taking over conversations, because I can get a bit passionate about certain things. 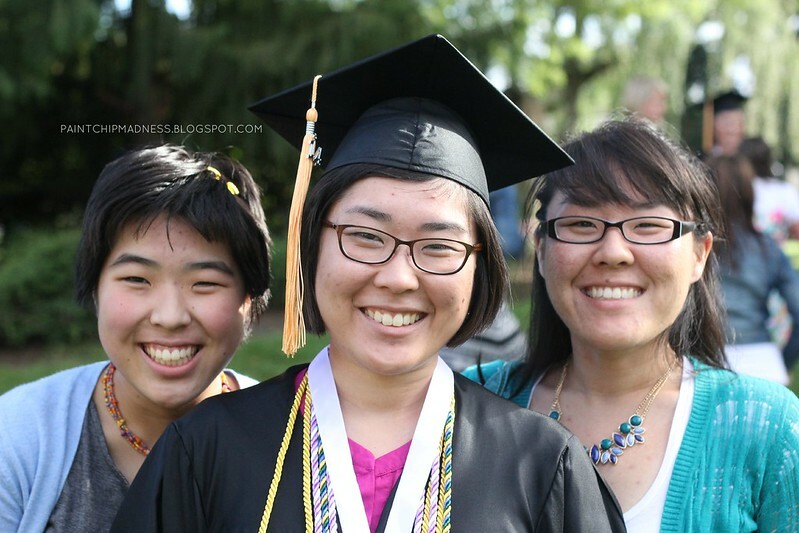 :) As a mom of an Asian son I would love if you blogged about being Asian. Something people find interesting about me is that I snort when I laugh. It's a hereditary thing and all the women on my mom's side of the family do. I forget about it but when someone hears me snort and laugh for the first time they are caught by surprised and think it's hysterical. And I'm thinking more and more seriously about blogging about being Asian. I don't really know a lot of other Asian bloggers and I feel like these kinds of posts are something so different from my norm. I don't want it to turn into something too debate-like (it being about race, after all) but I think that since I have such a great group of people who read the blog, it wouldn't happen. But I digress. :) We'll see what I come up with! Really? That's cool! I love that they not only met but they got married, too. It's really encouraging to hear the good stories from online dating--it seems like you only hear about the bad ones in the news and such. I'm not really thinking it's something for me right now, but I could definitely see myself trying it out in the future! I've heard the online dating thing works too, i don't know anyone that has tried it though. but like you i would be afraid of all the creeps and weirdos that are out there. I haven't had my license until not too long ago (25th birthday), i know i know, so long. But like you I was afraid to drive at first but now i love it, i can't imagine not doing it. I'm introverted all the way too! And I waited a long time, too! I didn't really start to feel comfortable with driving until a few years ago and even now, I still psych myself out. :) But it really is something that I do enjoy, now that I think about it (just not in big cities!). First, I have a couple family members who met their spouses through online dating. They seem very happy, so I would say it's worth considering!